As a makeup enthusiast and a YouTube addict, my favourite category is either swatch videos or recreating celebrity makeup looks. Oh! hoe I love seeing the transformation of one person into another just by the power of makeup. I really find them highly creative rather than the random haul videos. If I am to name a few of my favourite inspired look videos (which are tons off course) I would pick JLo's inpired makeup tutorial by Huda , Kylie Jenner inspired makeup by Roxette Arisa , Penelope Cruz inspired makeup by Makeup By Ani among the the huge talented lots. Now that we are desi , we wouldn't be able to do justice with an international look given our skin tone, eye colour and hair colour. The reason being just mentioned I earlier decided to do an Aishwarya Rai Bachchan's Cannes inspired makeup look earlier which received so much love from you guys and now I came across this image of our very own Priyanka Chopra when she attended the Marrakech International Film Festival and her net saree and lace blouse became the talk of the town! I've always liked Priyanka's style of dressing even though I don't find her experimenting with her makeup much. She always sticks to her matte makeup base and matte lips , generally playing around earthy tones and nudes. But at this paticular event she turned up in smokey eyes , pink lips and very pronounced pink blusher. For the face, I started with Patanjali Aloevera gel as a primer/pre base. I wanted a clean and covered base thus I used Maybelline Matte and Poreless foundation for it. For my NC30ish skin tone I mixed the shades Sun Beige(310) and Natural Buff(230) to get the correct match. I generally use Real Technique Sponge to apply my foundations and did the same for this look as well. 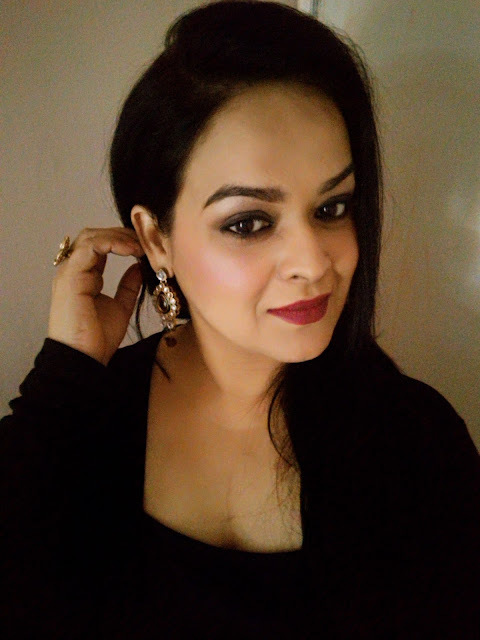 For setting the makeup I used Lotus Herbals Pure Radiance Natural compact in Caramel. Since it wasn't a chiseled out look and not harsh contour or highlight was obvious, I used a very light hand at giving dimension to the face using Kat Von d Shade Light palette. Blush was majorly visible on Priyanka so I used Wet n Wild Pearlescent Pink with a rather heavy hand than I usually do. The blusher itself has shimmers so I skipped using a highlighter altogether. For the eyeliner , Maybelline gel liner was put to use and I skipped the falsies and just used Oriflame Giordani Glod masacara to open up the eyes and finish the look. For the eye brows I used a matte dark brown eyeshadow to fill and shape and brushed it out to avoid too harsh brows. 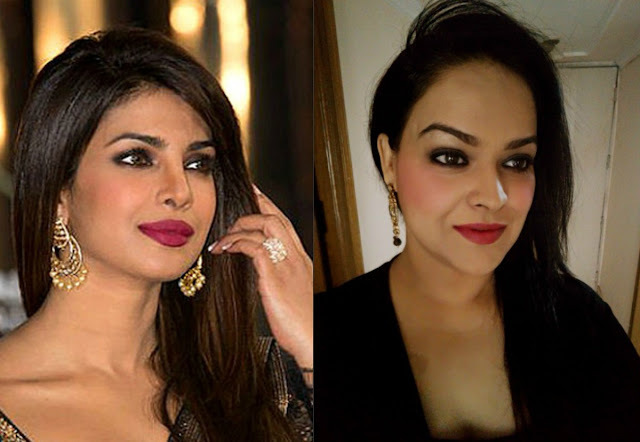 Priyanka Chopra is a brand ambassador for matte lips. 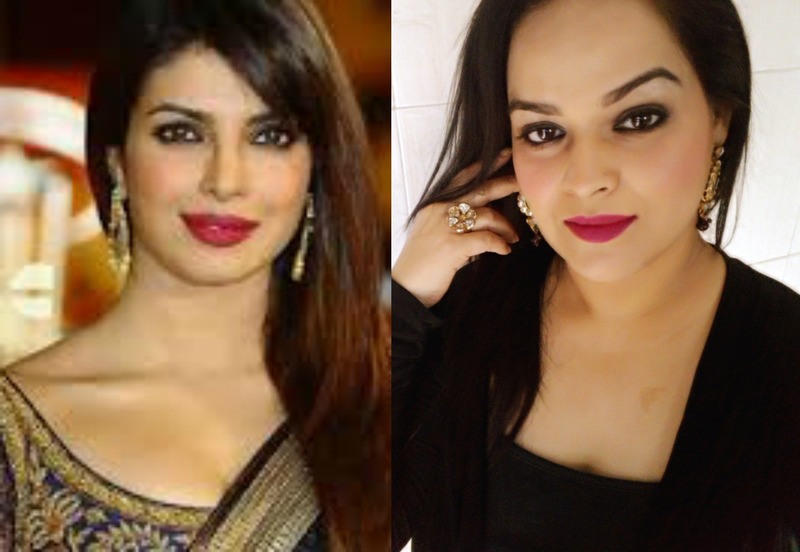 Even when the whole bollywood was wearing creamy , satiny , glossy lips, Priyanka stuck to her matte nudes...much much before the matte lip trend. In the images above too she is seen wearing deep fuchsia with purple undertones. 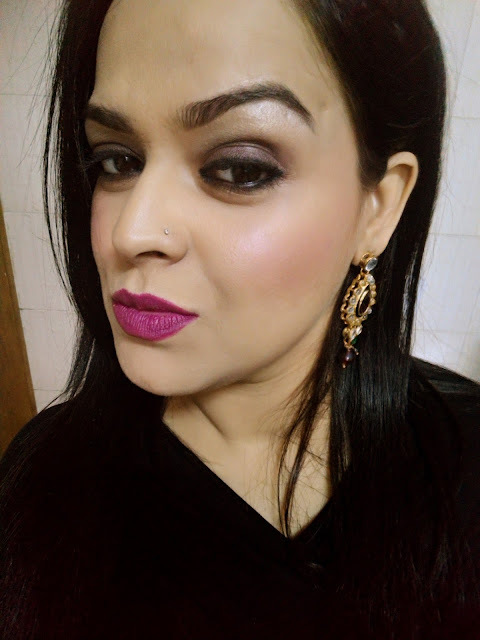 Lakme Absolute Lip Pout in Magenta Magic was quite close to her shade but it required a slight dash of purple for which I mixed a little bit of Huda Beauty Material Girl. That's pretty much all that was done to achieve the Priyanka Chopra look!! !